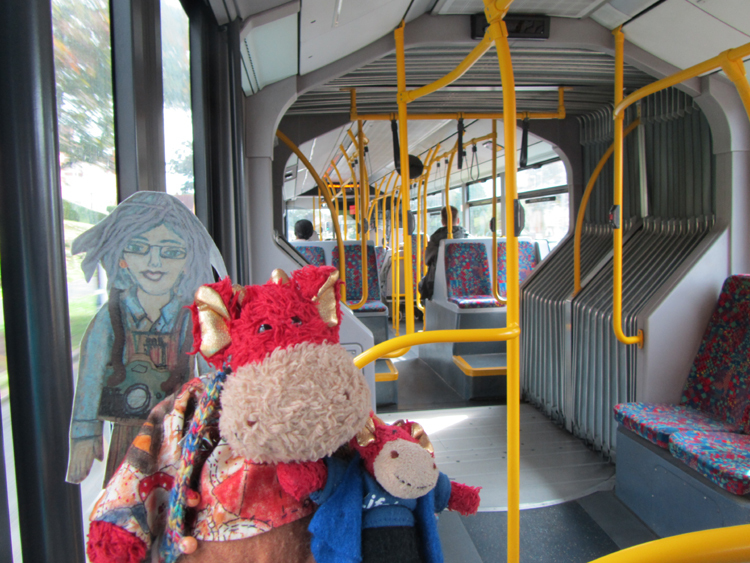 The story of a red plush dragon and his friends. 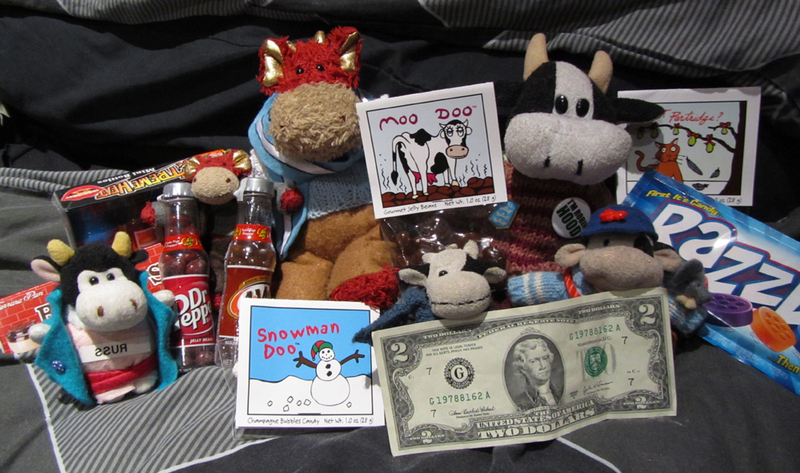 Our weekend started really well because we got an enormous parcel from Merica from Auntie Kate and The Hand and George and Gund and Nigel who sent us loads of stuff and Moo thought the Moo Doo was really funny. We haven't eaten any of those yet (they are jelly beans really) but we tried the snowman doo and they were dead good! 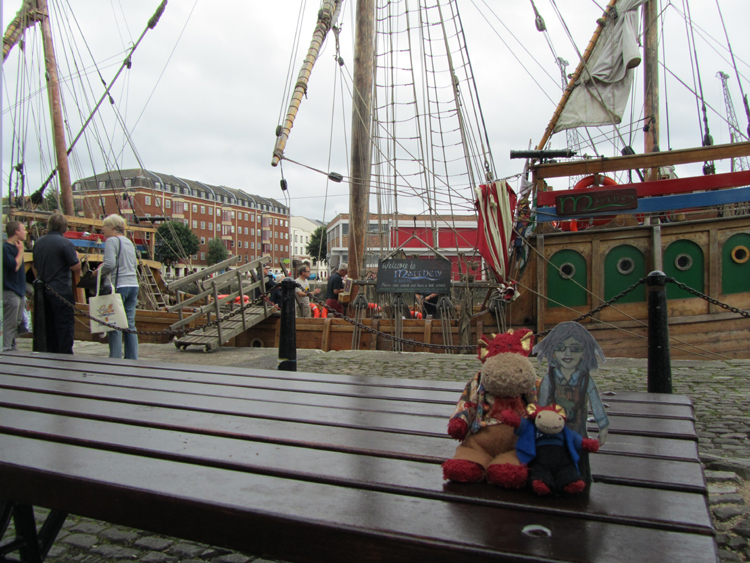 We thought the weekend couldn't get any better and then Mummy said we were going to Scardeburg to stay in a hotel overnight and see the sea. 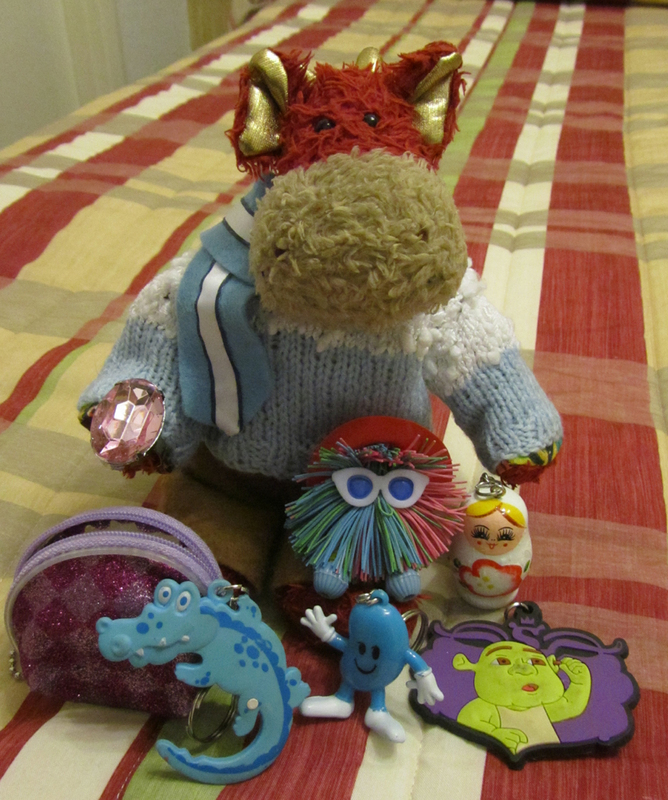 We went to play on the penny slot machines that cost tuppence and we had a really successful time because we won loads of swag. I got all this stuff and mummy got a watch and a garden gnome. It was only a little gnome and it will end up in a houseplant pot. The pink jewel is for my hoard. All dragons have a treasure hoard and the last time we went to the seaside I won a big pink jewel. This can go with it. I think I shall let Dewi have the blue jelly bean though because he has a big bag to keep his stash in and it's not very full. 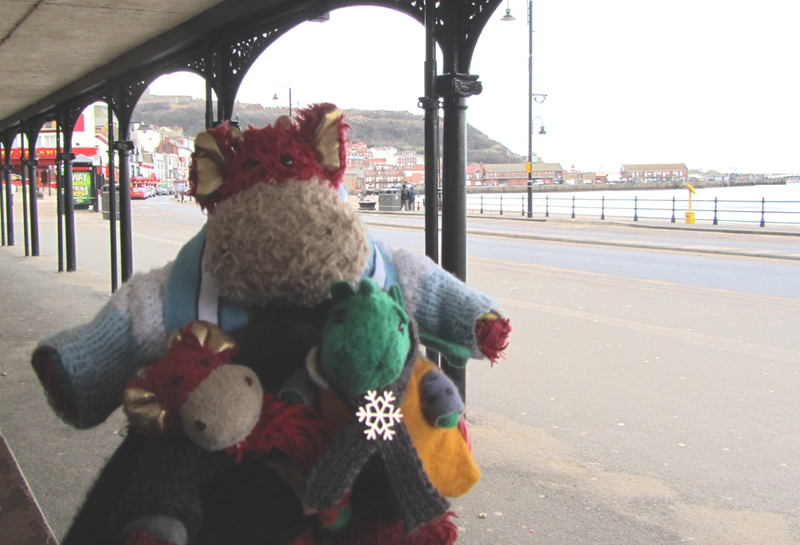 Today we went for a long walk by the beach and it was very blowy so we sheltered under this iron thing and just enjoyed the view. You can't really see very much except the hill where the castle is and the pier. There's a lighthouse too but you can't see it in this photo. We all had our warm clothes on because it was dead cold! I had my snowball jumper on and that was a good thing because it snowed yesterday! 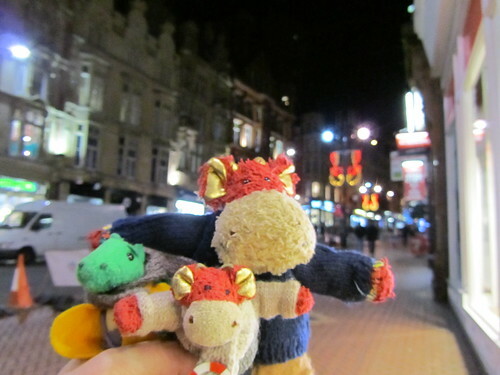 Bamburgh had his thick jumper and a scarf on, and Dewi had lots of layers all the way up to his body warmer. He had a scarf on too, with a snowflake pin that he got for christmas. It was really suitable for this weekend because it was cold but it was good fun too. I hope you all had good weekends as well. 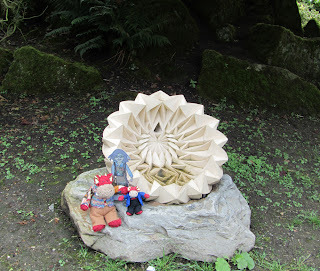 We went to Brumingham at the weekend because lots of German people have come to make it all festive. The council has been good and put pretty lights on so that everybody knows that Yule is coming. There were lots of stalls selling pretty things but the best bit was the food because there were pretzels and pancakes and cheesy things and frankfurters and burgers and fruity bits covered in chocolate and we had loads of them. What are you doing about Christmas? Last night just before we went to bed mummy said we have to start thinking about christmas. Well some of us think about christmas all year (mentioning no names but some of the younger cows come to mind!) because they are always planning how to get more swag. Moo said she only said it to make us behave ourselves because Sandra Clause only brings pressies to good dragons and cows but I think she means that there's lots to do to make it fun and it's only a few weeks away now. So anyway I think what she meant was we have to start getting things ready. We made paper chains a couple of years ago and we decorate a tree every year because we have our own little plush-sized one. But what I really need to do is go shopping so I can buy mummy and Uncncnlecle Kevin some pressies and maybe stuff for the cows too. 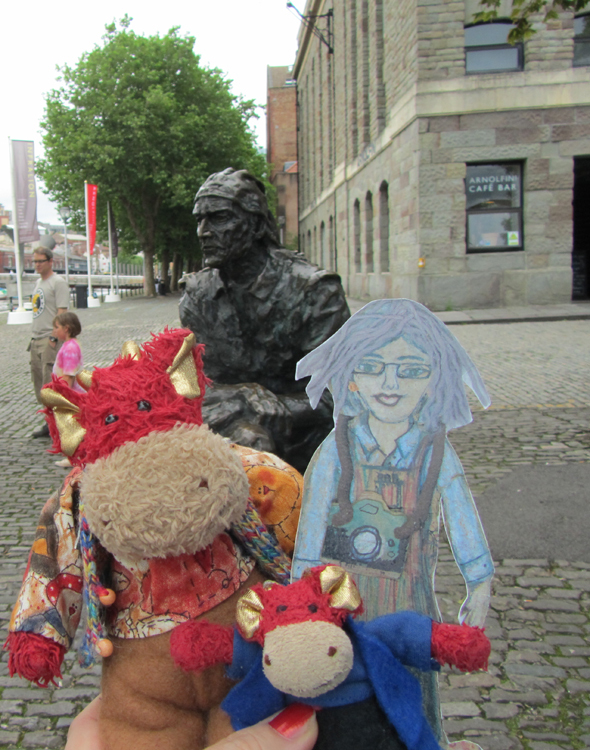 We have been away for the weekend because mummy had to go to a wedding but we got to have a lovely day out in a place called brizzle. 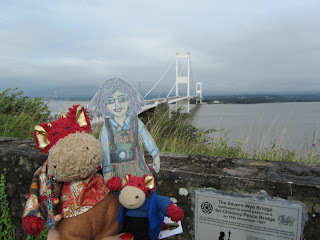 We had to go over a really big bridge to get there because the wedding was in Wales. 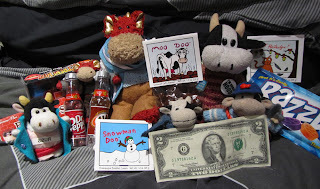 Mummy said that Ruthie would like Brizztol because it had lots of old America stuff. We parked the car up in a big place near the motorway and we got a long bus into town and it was so huge it had to bend in the middle to go round corners. 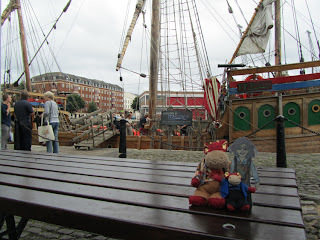 There was a man called John Cabot who had a boat called Matthew which is a silly name for a boat but it was only little because there was a replica of it next to a statue of him and we went to see them and we wanted to go on the boat but they had a special party going on so we couldn't. The building behind where the statue was used to be a warehouse where they stored stuff that came into the town off the boats and now it's an art gallery but we only went and had a coffee there because it was a nice day and mummy said we needed to be outside after being cooped up in a wedding all day before. 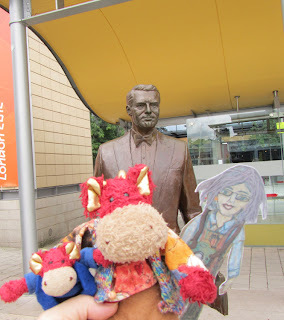 Then we went to another bit of town and we found lots of statues there and one of them was a man called Archie who was born in Bristol but went off to Merica and changed his name to be an actor and they all know him as Cary Grant which is another funny name. 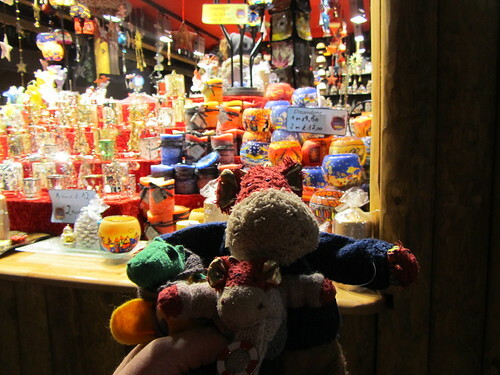 There are lots of nice places to eat in Brisztle but we found this great market called St Nicholas which is also a funny name because that's what Santa's real name was and it isn't Christmas. But anyway we had lunch there because there were lots of places to choose from and we had Carribbean and it was curry goat and rice and peas and vegetables and we really enjoyed it. You all know that we have Ruthie staying with us don't you? 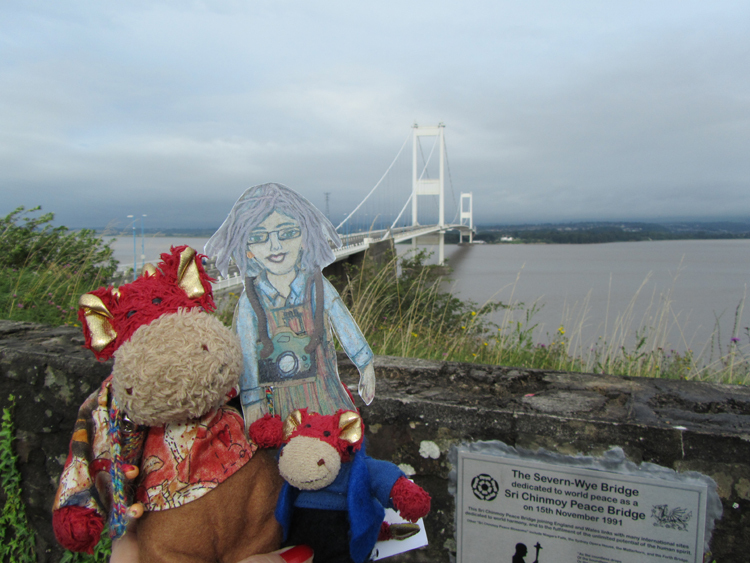 She's going to come to Wales with us next month but we're showing her some good stuff round home too. 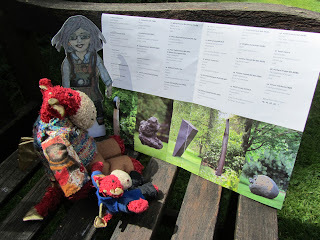 Every year we go to a place called Lester Botany Gardens, but they spell it Leicester Botanic, to see some sculpture stuff and we like looking at them because they are art but there are pretty flowers and trees and stuff too. 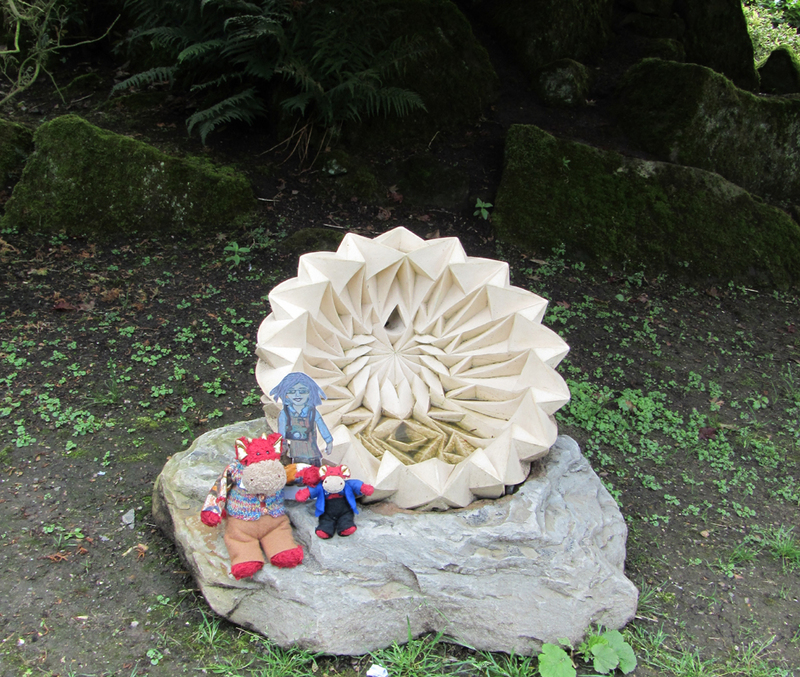 Most of this year's sculptures were really big so it was hard to get pictures of them but we found one that looked a bit like a piece of origami but was made out of stone. We got chance to have a good look at it up close. They give you a map of the gardens so you make sure you see all of the sculptures and we stopped half way to check where we were. It was good fun. There's a website where you can look it all up if yo like. 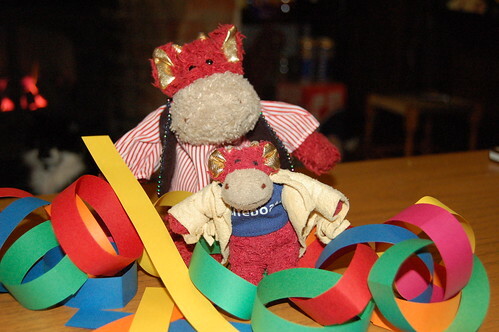 We had loads of fun at our birthday party. 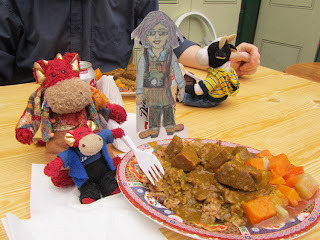 All us dragons got together with the cows and we had chicken and chips first and then we had chocolate and Mummy said we could have a bit of pink wine but only the big guys and not very much. We got loads of swag. The cows got us all cars to play with. We like cars. And Unclclecle Kevin got us a DVD of a cartoon thing with Johnny Depp in it and Mummy got all excited and said he's available now but of course he's available the DVD is right there isn't it? Mummy made us new shirts for our presents and she got this lovely patterny material all the way from Anglesey in Wales and that's where we are going on holiday later this year and I hope it will all be as pretty as the material. Bamburgh's shirt is grey because he's a bit of a fashionista and he likes smart stuff and dark colours and pretending he's Italian even though he comes from the North East of England. He's never been the same since he saw the Versace shop in Rome. Today is my birthday. I am six. Which is actually quite grown up if you realise that's dragon years. 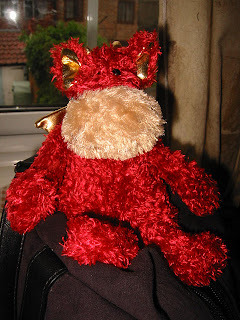 My brother Bamburgh has his birthday today as well, and he is six too. Even though he wasn't born until September. We both share because today is Midsummer's Day and it is fun to have a summer birthday. 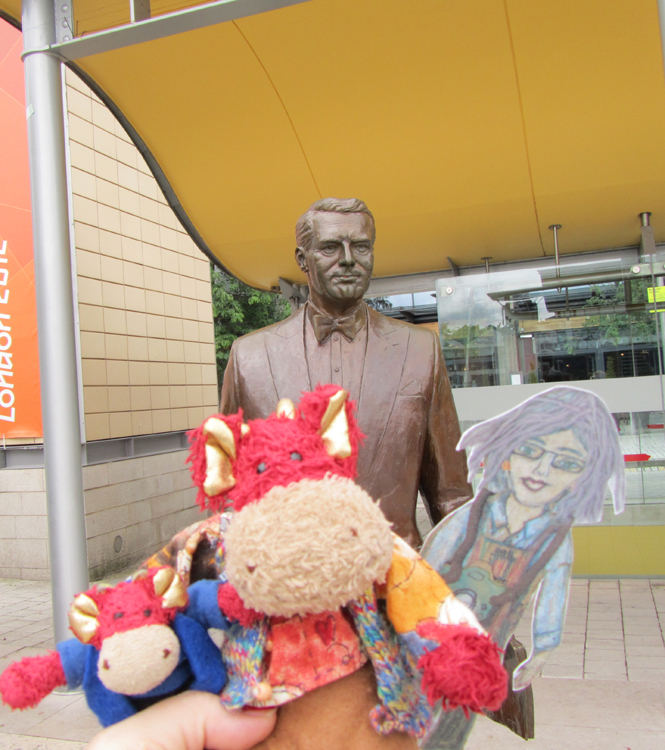 The photo of me was taken the day that Mummy adopted me. Wasn't I young and fluffy? I'm a red plush dragon and I'm 8 inches tall.